An example of a four station planetary mill available through the Gilson Company is shown below. To grind a sample in this device, you should already have reduced the particle size to less than 10 mm, using a mortar and pestle if necessary. Place your material in one of the bowls (shown in the lower right) and then add several balls (shown in a tray at the bottom). Samples can be run wet or dry. A cover is placed on the bowl and then the bowl is mounted in the machine. In the picture below, one bowl has been fastened down and the other has not yet been secured. Once the bowls are mounted and secured, the cover is lowered and the machine can be operated. Each bowl sits on an independent rotatable platform, and the entire assembly of four bowls is also rotated in a direction opposite to the direction of the bowl platform rotation. This action is a lot like the "teacup and saucer" rides commonly found in amusement parks. In planetary action, centrifugal forces alternately add and subtract. The grinding balls roll halfway around the bowls and then are thrown across the bowls, impacting on the opposite walls at high speed. Grinding is further intensified by interaction of the balls and sample. Planetary action gives up to 20 g acceleration and reduces the grinding time to about 2/3 of a simple centrifugal mill (one that simply spins around). Grinding media are available in agate, sintered corundum, tungsten carbide, tempered chrome steel, stainless steel, zirconium oxide, and polyamide plastic. The exact type of bowl and balls that are used depend on the type of material being ground. For example, very hard samples might require tungsten carbide balls in steel bowls. For typical use, agate is a good choice. 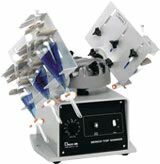 As with any method of grinding, cross contamination of the sample with the grinding unit material can be a complication. While ball mills save considerable time and effort over hand grinding with a mortar and pestle, this is not without cost. List prices for the simplest jar mills are in the ballpark of $3,000 USD, and 4-station mills like the one shown above can cost $10,000 or more. Grinding bowls with lids can be $1,000 to $2,000 each depending on the size and the material required. Balls can add from $25 to $400 per bowl depending on your material needs.